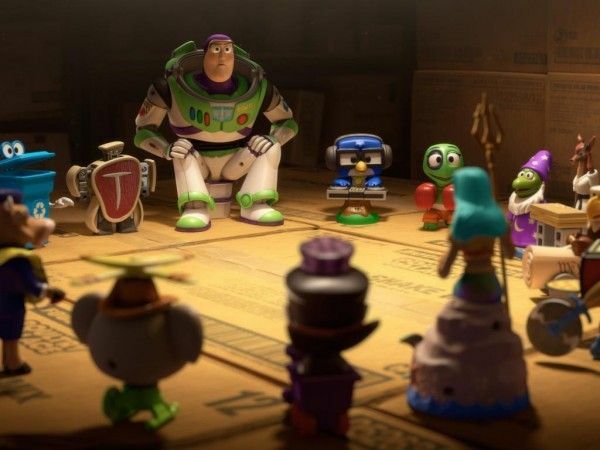 In the new Toy Story short Small Fry, playing in theaters with The Muppets, Buzz Lightyear (Tim Allen) is left behind at a fast food restaurant when a kids’ meal toy version takes his place. While the three-inch-tall Buzz impersonator incessantly annoys Woody (Tom Hanks) and all of the other toys, the real Buzz is trapped at a support group for discarded toys, run by narcissistic group leader, Neptuna (Jane Lynch). As Woody and the gang plan to rescue their friend, Buzz attempts his own escape. Question: How many Toy Story shorts are there? ANGUS MacLANE: I can’t tell you that. I’m afraid that I can’t say. There are others. That’s as much as I can tell you. When did you start working on Small Fry? MacLANE: August of last year is about when I finished the script, production started in January/February, and we finished in September. It was about a year, from start to finish. The Pixar films have long had short films attached beforehand, and now you’re going in front of other Disney movies as well. Is that the game plan, for the future? MacLANE: I can’t say. I think they’ve done it once before. Tokyo Mater went in front of Bolt, during the second week of release. [Small Fry] is pretty weird. They were like, “I don’t know what to do with this thing.” Disney had the idea, and I was totally stoked about [putting it in front of The Muppets]. I don’t know what they’re going to do, going forward. It wasn’t going to go in front of a Pixar movie because they have a short for Brave, and they wanted to get it out, and they had this opportunity. They asked me what I thought, and I said, “Yes, please!” As soon as I left that meeting, I was like, “Call them and make sure this happens. Who do we need to talk to? Get Kermit on the line.” And, it worked out. I love short films. Pixar has always been into short films. This is a weird one, and I’m glad that it’s on a weird movie. They’re both funny. Where did the story for Small Fry originate? MacLANE: It’s a combination of ideas. BURN-E, the first short that I directed for Pixar, was about a welding robot, and my dad used to be a welder. My mom and my sister are psychologists, so it’s an inside family joke, to do the support group thing. I also really, really like fast food toys. I like toys, in general, but there’s something about fast food toys that feels really unloved. They have a really short shelf-life, and they only do one thing. Actually, if you look at the Monsters Inc. Happy Meal toys, there’s a Yeti toy that’s really good. It looks just like the production designer’s drawings. Whoever makes these, someone is putting a lot of love into them and making whatever compromises they need to. They have the property and they have a price point, and it’s about what they can put into it. I thought that there was an interesting story there. And then, because there wasn’t enough ideas in the film, I also wanted to play with the idea of another imposter Buzz Lightyear, but that had a giant head. Will they let you show this in San Francisco, as they don’t have Happy Meal toys there? MacLANE: This is a film that really is from a bygone era of ball pits. I used to work in a ball pit, at a place called The Discovery Zone. I was a kids’ coach, which meant I had to stand ankle-deep in the balls and make sure no one was drowning, and it’s not a pleasant business. As a kid, you wish your house was made of habit trails. But, as an adult, it was a terribly depressing place. It was really weird. A lot of the toys, and all that stuff, is just an homage to a lot of the properties that were popular from 1980 to 1990. This short brings back most of the Toy Story voice cast. Was it easy to get everyone together? MacLANE: Well, it’s not easy to pay off those characters. If everyone has an arc, then you have a 12- or 15-minute movie. We knew we were going to have this side story of Buzz, and then we were going to cut back to the room, and you’d have to do certain things. 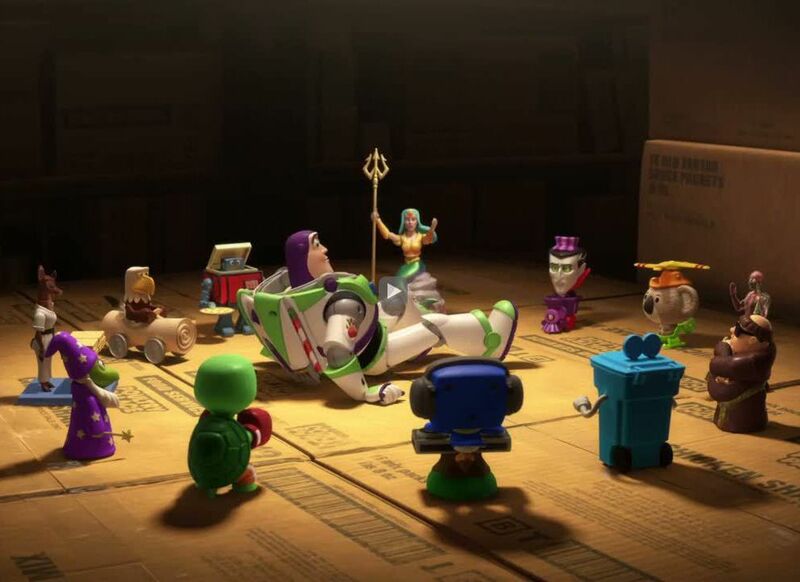 There was a bit that got cut out, where mini-Buzz was strapped to the glue bottle and they were arguing about what to do with him. They were like, “I think we should kick him out. We should get rid of him.” Mrs. Potato Head was like, “No, he’s a toy. He has feelings too.” And he goes, “What do I gotta do to get a foot massage around here?,” and you see his little feet [go up and wiggle]. And then, Mrs. Potato Head was like, “I say we throw him out! Let’s get a rope!” And, I had to cut it for time. How much did this story change, throughout the process? MacLANE: The biggest change was seeing how he was going to get out of the meeting. Gary Grappling Hook was actually a narrative device. It was either Gary Grappling Hook or the Lizard Wizard, partnering up in support group for a trust fall thing. And then, John [Lasseter] was like, “Just have them both, and have them also escape.” The other thing that changed was that we recorded with Jane Lynch about five to 10 other toys that didn’t make the cut, that were really weird. They were so bizarre. There was Freaky Bee-Keeper. It was funny, but it just didn’t get the laughs. There was Creepy Zebra, Baguette Jet, Haberdasher Badger, Bifocal Cyclops. I liked Bifocal Cyclops. Haberdasher Badger was just a badger with hats and really dumb jokes. We cut them all together, and then just cut out the ones that didn’t work. And then, we’d workshop the jokes. With Vlad the Engineer, I couldn’t figure out what to do. I couldn’t get a joke out of it. Finally, we came up with, “Nobody wanted to board the vampire express,” but that wasn’t funny or weird enough. So, I was like, “Why don’t we just add one element,” and I did a drawing of a werewolf that came up. And then, it was about when to cut. It doesn’t quite make it to the top. There were too many ideas at once. That was the over-arching theme. With a lot of the toys, there were too many ideas. With the Robotic Pirate, you can have a robot movie and you can have a pirate movie, but if you have a robotic pirate movie, it’s two generations away from everyday life. I hope they make a super-pirate TV show, or a ninja clown TV show because it’s not a good idea. Funky Monkey is from a fictitious CG movie, called Rappin’ Robin in the Hood, about Rappin’ Robin and Lil Juan, and it was this really bad hip-hop/Robin Hood story. It’s Producer Paul and Officer Nottingham and MC Maid Marian. It’s all terrible ideas that I hope catches on and they want to make. It’s just bad committee-think toys. Did you ever think this idea could be a full-length feature? MacLANE: I don’t know. I feel like a lot of the humor in this is cutting away. I think there’s something about a short where the opulence is the joke. There’s so many toys, you’re like, “What? !” You leave them wanting more, but there’s so much crap wedged into it. The quick cuts are the joke to it. John [Lasseter] was really adamant about the pace being quick because that’s what was funny about it. Sometimes we let some stuff breathe, and he was like, “No, you’ve got to move it along,” and I think he was really right. Part of it is that they don’t get their chance to shine. Some of the characters have an arc. Gary Grappling Hook is under-used, and then he finally is used and he’s stoked. I put a Condorman toy in the movie. It’s in there. I’m hoping for a very small sub-set of the Disney animation fans to be stoked that there is actually a Condorman toy. Maybe it will stir up some buzz about a gritty re-boot. I enjoy Condorman. In 1981, what did you have for superhero movies? There was nothing. The idea of a comic artist that then would become a superhero, and he had a car that turned into a boat, it doesn’t matter that it’s glacially paced, it’s amazing to a six-year-old. So, it’s a nod to Condorman. Can you talk about working with John Lasseter? MacLANE: I’ve worked with John for awhile. I’ve been at the studio for 15 years, in January. He was really supportive and really trusting. 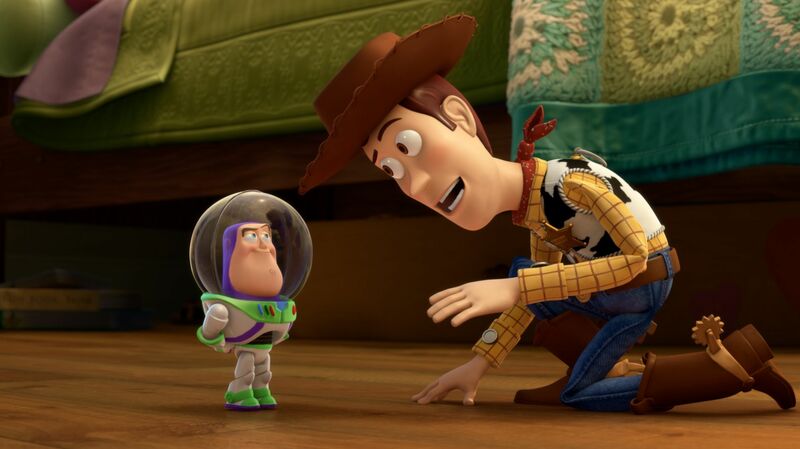 A lot of the previous Toy Story films have a lot of nostalgia for ‘60s and ‘50s toys. 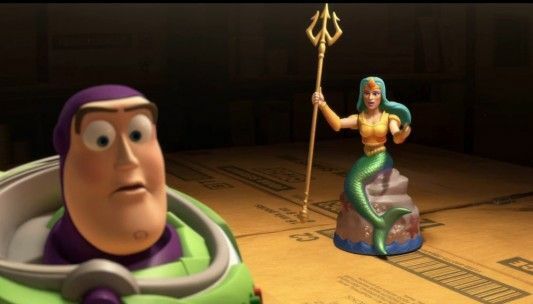 There are not a lot of ‘80s toys in the Toy Story movies. There are some that hint at it, but they’re not to the level of specificity, in my mind, of where I wanted to go with Small Fry. John didn’t get all of the jokes or references, but he was really trusting when I said, “Look, this is funny.” He would get it, on some level, but there was a lot of really small, dumb jokes that he’s not going to know from that era. But, he was so trusting and supportive of that. It still had to work on a story level, though. He was having a good time, and he’s such a great mentor. We have a good relationship. It’s one of mutual respect. He’s really generous with his time. You show him the movie, at every stage. I also showed it to some of the other directors and got some feedback. This was more showing it to John, and John was like, “Yeah, it’s fine.” I would seek feedback, as needed, but because it’s a short film, there’s less pressure on it. It’s not driving the summer movie [box office]. That was actually really freeing. In the short format, there’s a lot of really weird, insane jokes that you can put in it. If you put it in a full-length movie, it’s crazy town, all of a sudden. There is peer to peer review, and I definitely showed it to as many people as I could, but it’s not the same as a feature. Did you make sure that the toys would be things that could actually be made? MacLANE: Yeah, they’re going to make some toys, I’m excited to say, and they can use direct-to-digital output. I’m not sure how they’re going to solve some of the cheating we did with the transforming T-bone, but I think they’ll be able to handle Ghost Burger pretty well. When we went into it, I was like, “We’ve gotta do it right, so if they make the toys, they can just be the right thing.” I think they’re going to make them the real scale. They’re going to do it, so that you can have your own support group. Where will they be available for sale? MacLANE: I think they’ll be sold as a Disney Store exclusive. Did you have a lot of toys, as a kid? 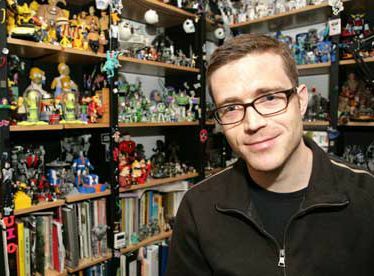 MacLANE: We made our toys, which is why I do this now. We’d buy the figures, and then we’d make them, and they were brilliant. Whatever I was into, we would make together. That sense of do-it-yourself and making stuff is why I still do what I do, and why I’ve over-compensated so heavily in buying toys and been so into it. What did you learn from the experience of working with the voice talent that will help you, in the future? MacLANE: That’s a good question. 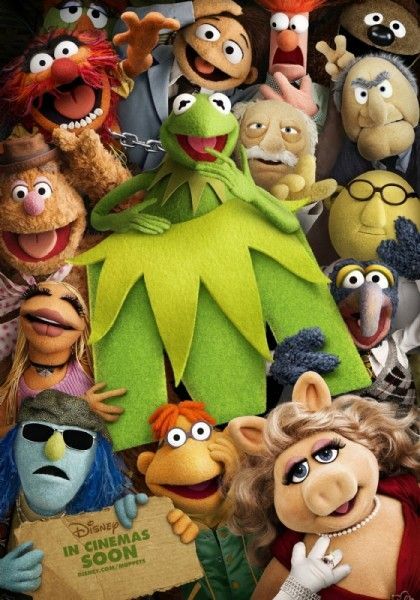 You have to get the voice talent into the place where they’re used to the character. Tim Allen said that he and Tom [Hanks] had to keep saying the same things, over and over again. Apparently, the line for Tom Hanks was, “Come on, guys!” Luckily, I had Tim Allen record one day, and then the next day, I had Tom Hanks. I was recording with Tom Hanks, and he was in a great mood and was doing great, and I said, “Yesterday, we had Tim here and he said that you guys always feel like you’re saying the same thing, over and over again. Apparently, you say, ‘Come on, guys!,’ a billion times.” And, he started laughing and saying, “Come on, guys!,” and even though we didn’t need that line, that got him into Woody, even more than he was already. It was really good to see that there are ways of reminding them what the characters are, and just be loose with the working environment. It can be something as simple as repeating a line that they think they’ve recorded a bunch of times and, apparently, they have. I think we even put, “Come on, guys!,” in the movie because of that joke. It sounds like Woody. I thought that was interesting. Do you want to direct full-length features, at some point? MacLANE: Yeah, I think so. It’s a different challenge. This was a good step up from BURN-E. The voice talent for BURN-E was nothing. It was mostly pantomime. This one had a lot more voice directing and dealing with talent, and trying to get dialogue to not be too much and deliver exposition. The learning curve on Small Fry was a lot harder than BURN-E, but this was a great way to go then right to a feature. I wouldn’t have known what I was doing. I’m at a good trajectory. Someday, maybe, [I’ll direct a full-length feature]. We’ll see. I hope so.